My goal with this post on being your own boss is draw from some of my personal experiences in being an entrepreneur and what I observe in many of my friends and colleagues with similar lives to share with you the 3 things people underestimate when starting a business and being entrepreneurs. I believe that entrepreneurship has been placed on a pedestal by society and many consider it the dream life, where one gets to sit on a beach and drink Piña Coladas all day while earning passive income from some automated system. While that is possible (I have in fact ran a profitable online business with a manager taking care of daily systems, all from my smartphone at a 5 star resort in Phuket), it doesn’t happen overnight and it’s not the default mode of operation. 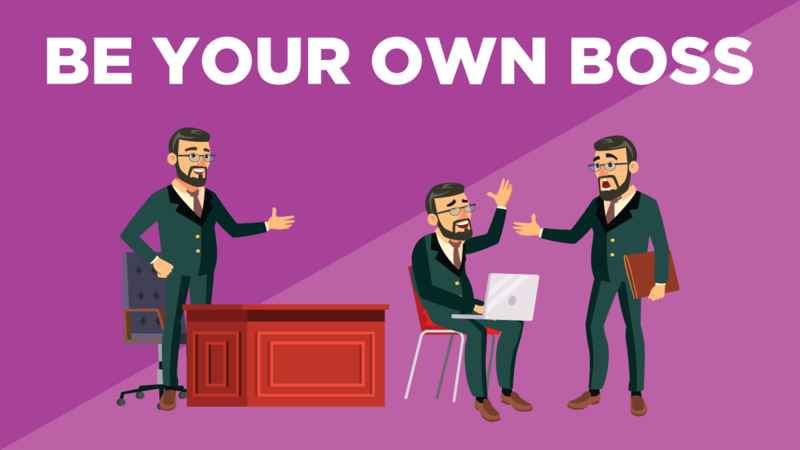 This post goes behind the scenes of working for yourself and what you can expect day in and day out, so for all those who are thinking about starting your own company and being your own boss, this post is for you. I’m currently writing this to you in Sardinia, Italy, an island that shares the same latitude as Naples, off the southern coast of the mainland. We retreat here every summer, although we haven’t been in three years because, well, life happens as they say. I’m taking a full three weeks off, and though I travel most of the year, this is the first trip I’ve taken with no motive other than pleasure. I’m fortunate to work online, which means I can live and work anywhere at any time. There’s always something more to be done, and it’s hard to resist the urge not to maximize every moment. When you know that every hour you put in has a given utility, the temptation of work follows you everywhere. 1. They start without clear goals and are misguided about the idea of passive income. 2. They underestimate the stress of constantly being involved with work (even if it’s only mentally). 3. They underestimate the stress involved of not having a stable income, the potential for financial ruin, or the time it takes—sometimes several years—to get a business off the ground. Contrary to what you’re being sold there is no such thing as passive income. Everything requires management, and the plain truth is that the more you scale and grow, the more work you have to do, not the less. This is true because there are more people for whom you have to oversee, more potential problems, yet more potential opportunities. This is a key point to understand because many people have businesses that make $100,000 a year while managed with one or two employees, enabling the entrepreneur to live a low stress life. However, because they want to scale the business to make $250,000 (often arbitrarily), they take on a ton of additional stress. This is often unnecessary as many people don’t know why they want to scale in the first place, but they do it anyway, because they can, because others are doing it, or because they’re told there’s opportunity in doing it. What I advise is to work backwards and reverse engineer your ideal lifestyle. First, figure out how much your ideal lifestyle costs and then make the numbers work with your business to allow yourself to live whatever life you want. If that magic number is 100k, then I’d challenge you to think deeply about whether or not you actually want to scale to a quarter million. Second, it’s important to understand that your business will always require your attention in some fashion. Even if you have systems in place where others can make decisions for you, ultimately when there’s a major problem or decision that needs to be made, it will work its way up the ladder to you. This may happen when you’re on that vacation that you promised you wouldn’t work on. It could happen when you’re tired and stressed, when—more than anything—you want a break from your company. And the truth is that the decisions you make can have major consequences for your company and its employees. If you’re not always ready and willing to take on that pressure and stress, then entrepreneurship isn’t for you. Even if you successfully implement systems that remove you from the day-to-day operations, say hiring a manager for example, you’re still mentally connected and thinking about the problems and opportunities of your business. I can’t stress this enough. For some, this alone will prove to be a deal breaker; they’d be far happier working for someone else, where they have the underappreciated luxury of mentally checking out on weekends and holidays because whatever problems they had at work are ultimately their bosses. When those problems become yours, you don’t get the luxury of being completely mentally detached on weekends, or at your kid’s soccer game, or while you’re watching a movie, or at 10:00p.m. when you just want to go to bed. There’s always something to do, something that can be improved, or something that needs fixing, and since these somethings are ultimately your problem, you’ll find yourself constantly thinking about them. It doesn’t matter how much journaling, meditating, or fiction reading I attempt to do, I can’t help but think about my business in some fashion on a daily basis. And the truth is that’s how it should be. If you don’t have a business that you’re extremely passionate about, you’re not going to succeed. I know what some of you are thinking: when my business reaches its goal that allows me to live my ideal lifestyle, I won’t care about scaling or growing, I’ll just leave it on autopilot, yet in my personal experience this is not true. That’s like saying you’re going to stop thinking about your child when he turns 18 because all the problems are his problems. If he calls you, you’re still going to be there and you’re still going to be thinking about the problems in your child’s life because it’s in your nature as a parent. The same is true for your business: it will always be on your mind in some fashion. After you’ve worked for years to grow your baby from nothing, you’ll want to continue to do what’s best for it. Entrepreneurs need to be prepared for this when debating whether or not to start their own company. If being engaged on Saturdays and holidays isn’t something you’re willing to compromise on, you may not be suited for the job. And there’s nothing wrong with that. Society has idealized the entrepreneur lifestyle, but it’s not for everyone. In fact, if everyone founded companies there’d be no one to work for them. Just based on the numbers alone it makes sense that only a small fraction of people are actually going to be founders, and I’d challenge everyone to think deeply about whether or not this role is for you. Indeed, I’ve met with many people who are interested in starting their own company, yet I find that the majority of them vastly underestimate the time it takes to be successful. They see people come onto the market and it seems like they are overnight successes, when in reality it’s oftentimes a decade of work and grinding that went in behind the scenes to get them to that point of launch. As a result, it’s prudent for the aspiring entrepreneur to think deeply about how this instability will affect his or her stress levels. Can you handle not making money for an extended period of time, or not knowing what your monthly sales will be? Can you handle investing time and money in a product or project, testing it out and not seeing a profit, then have the fortitude to not chase your losses, trying to right the ship right after? All entrepreneurs face these challenges at one time or another, so success often comes down to who has the most patience, grit, and will. It’s imperative that you deploy self-awareness and understand whether or not you’re the type of person that will enjoy this process and thrive in that uncertainty. This completes my list of the 3 Things People Underestimate When Starting a Business. My hope is that you see what’s behind the curtain of entrepreneurship. It’s not all fun and games. You’re not going to be sitting on a beach all year drinking Piña Coladas. I’d bet anything that you’re going to work harder and have more stress than you would if you worked a normal job. But it will allow you to create whatever lifestyle you want, and work on something you’re deeply passionate about, and for me personally, that’s worth all the engagement and stress that comes with running my own business. I love what I do. I love the process. I love getting punched and having to get right back up. I thrive in the uncertainty and chaos. I love the immediate feedback that the market gives me when I launch a new product or idea. For me it’s a game, and I love playing for the win. If that sounds like you, then fasten your seat belt and charge forward and be your own boss! P.S. I hope you enjoyed this blog post on the 3 things people underestimate when starting a business and being entrepreneurs. Are you an entrepreneur? What are you struggling with the most? Leave your thoughts or questions in a comment below, and I’ll do my best to help address them here or in a future post.